Jackie and I spent a few hours at the Urbana Park District’s Perkins Road Site, some land just behind the Urbana Dog Park that used to belong to the Sanitary District and was used for sludge ponds. The area is being restored as wet prairie. Jackie and I joined a crew of about a dozen people cutting invasive bush honeysuckle and burning it. I went to one or two stewardship workdays with my dad in Kalamazoo at preserves belonging to the Southwest Michigan Land Conservancy, but (probably just because of the details of what needed doing at those sites those days) didn’t come away with enough of a sense of accomplishment to prompt me to find similar opportunities here. Since Jackie got involved with the Master Naturalists she’s been doing a lot of these, and I’ve joined her on several. We cut bush honeysuckle at Meadowbrook Park, and on another day gathered prairie seeds there. We pulled winter creeper at Weaver Park. 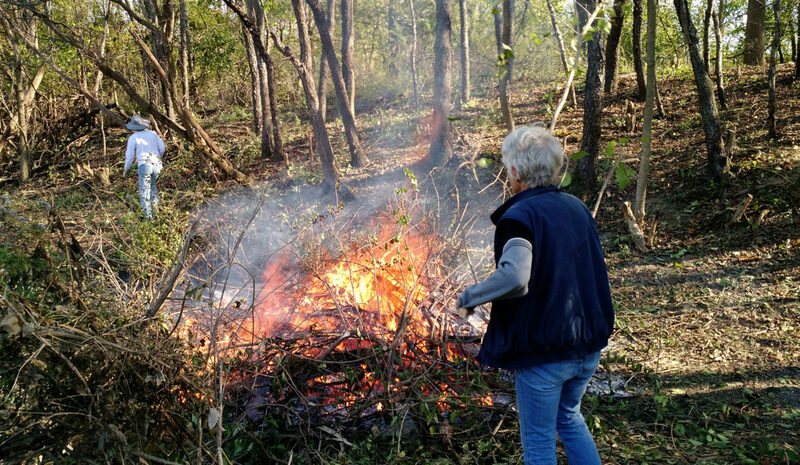 And yesterday we were back to clearing bush honeysuckle—with the bonus that, because this site makes it difficult to haul things out, this time we got to burn it as well. There’s an atavistic satisfaction that comes from playing with fire. Highly recommended. Don’t burn yourself.